Are you planning a trip to Ashe County and want to get the full experience? Visit during in July to get a taste of the Christmas in July Festival – an Ashe County Tradition held in Historic Downtown West Jefferson, NC. 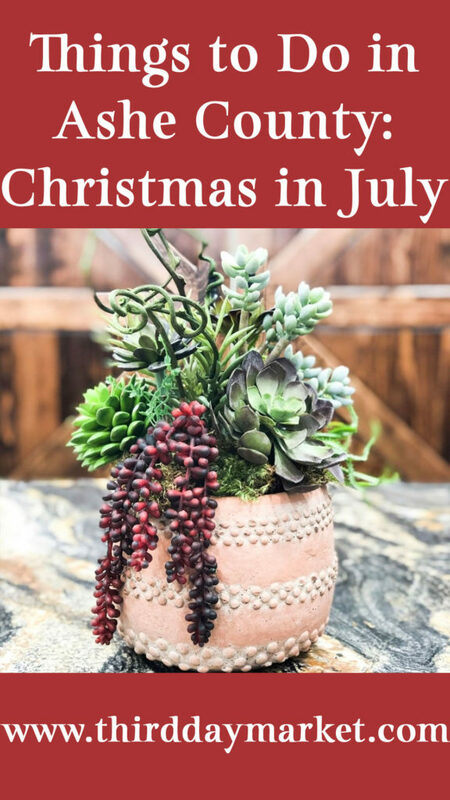 Located in beautiful, historic Downtown West Jefferson, Christmas in July is an old-fashioned festival showcasing the heritage of the Blue Ridge Mountains. The festival started as a celebration of the Christmas Tree Industry in Ashe County. Since its start in 1987, the festival draws thousands every year, both locals and visitors. The Christmas Tree Industry is still a big staple in Ashe County Culture, with Ashe County being the #1 Christmas Tree producer in the nation in 2015. The Ashe County Farmers Market is also open during the festival! Not only are you getting to experience an Ashe County Tradition first-hand, but it is truly fun for the entire family. Come see us this summer for the perfect dose of Ashe County!